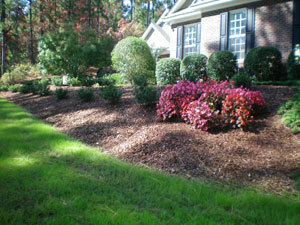 McCrimmon Landscaping & Grading; farm and landscaping services in the Southern Pines - Pinehurst NC area. Is your yard looking sad and desparate, in need of improvement? Does it need a major clean-up and new landscaping? Do you have a farm pasture that needs mowing or a horse farm pasture that needs maintenance? Do you have property that needs an irrigation system installed? Do you want the job done right by licensed professionals? McCrimmon Landscaping & Grading is licensed by the state of North Carolina to install and maintain all types of irrigation systems, both residential and commercial. View our Individual & Corporate Irrigation License (nciclb.org). We also mow and maintain farm pastures.